A lot of my first reading as a child was astronomy books and magazines. When I was little, my brother told me there was a black hole under his bed (to keep me from snooping—nerd children fight dirty), and after that, I had to know more about the enigmatic and alarming properties of the universe. One of the things I remember was the hunt for the first exoplanet, that is, the first confirmed planet outside of the solar system. Scientists were quite sure they should exist (why wouldn’t they? ), but the equipment and techniques thus far hadn’t shown them. I remember reading about some of the first exoplanets in the hazy early 90s. They were massive, close to their stars, and had outrageous properties that inspired wild imaginings. Now confirmed exoplanets number in the thousands. 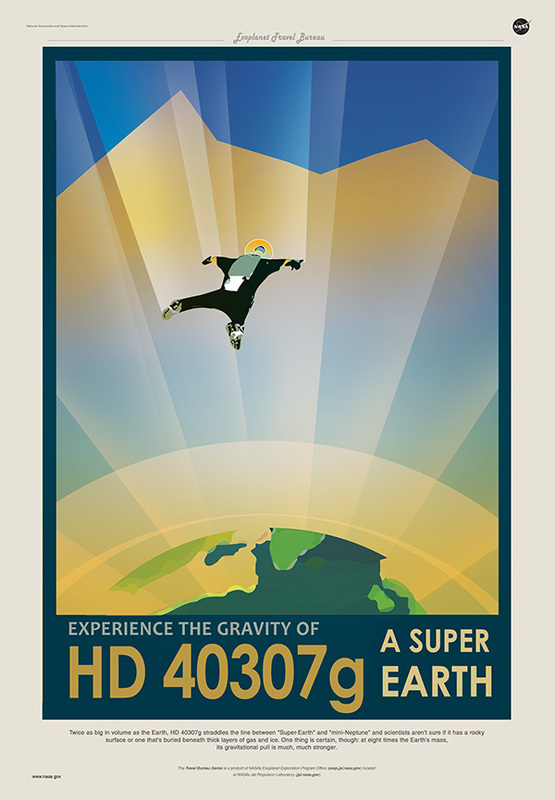 And poking around the internet on an unrelated chore the other night, I found this gem: the Exoplanet Travel Bureau. 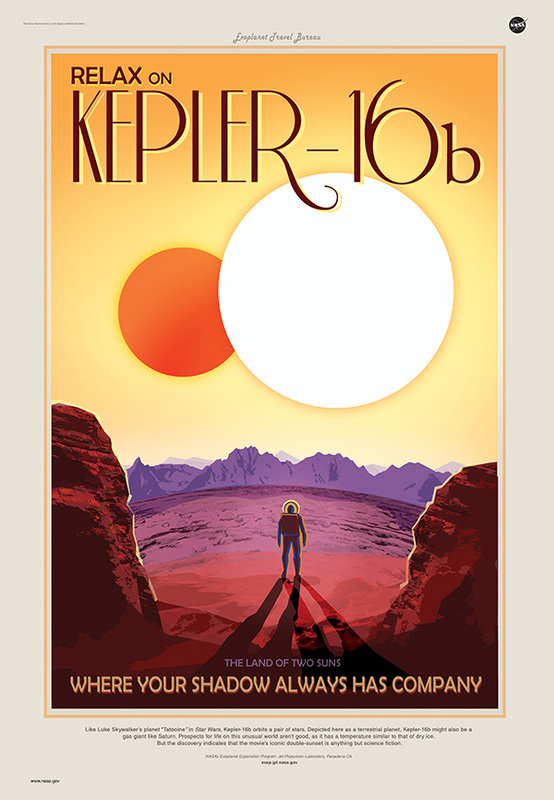 NASA’s Jet Propulsion Laboratory (the extremely prestigious and awesome JPL) made travel posters for four exoplanets in the style of retro travel posters. Each of them features characteristics of their planet. I promptly printed out three and hung them in my guest room. I’m still ecstatic about them; these are the kinds of visions and dreams I had so long ago as a kid, and that I love to chase in my own art. These are awesome, and I love them, and you can download them at full size. Tell all your friends, and print your own! Here they are! Click on the image for more image sizes. Images by the NASA Jet Propulsion Laboratory. 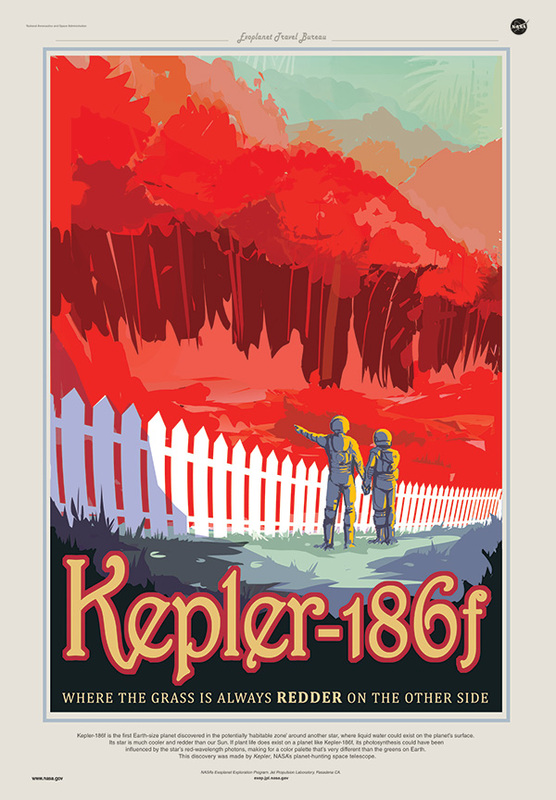 This entry was posted in Illustration, Science and tagged astronaut, astronomy, astronomy poster, exoplanet, exoplanet travel bureau, exoplanets, fantasy, jet propulsion laboratory, JPL, NASA, outer space, planet, planets, poster, posters, retro, retro science poster, science, science fiction, science poster, science travel poster, space, travel poster on August 24, 2015 by Vironevaeh.